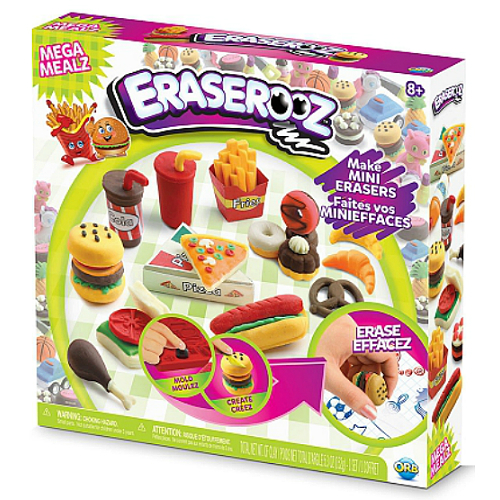 Design your own stationery supplies that look like favorite foods with Eraserooz Mega Mealz. Sure to be a hit creating erasers of pizzas, fries, burgers, soft drinks and more. Make 15 styles of your DIY erasers. Place the compound in the double- side mold and press, then use the sculpting tool to create adorable details and completely customized creations. Pop your sculpt out of the mold and place it in the oven on low for ten minutes. Remove and reveal your brand new miniature erasers. includes molds, spray bottle, 8 eraser clays and styling tool. Measures approximately: 9.50 x 9.00 x 1.75 inches..